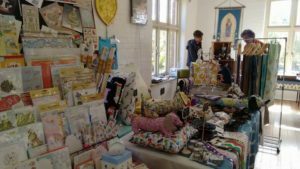 All Saints Market is open from 10am-3pm on the last Saturday of each month excluding December when it is on the second Saturday. 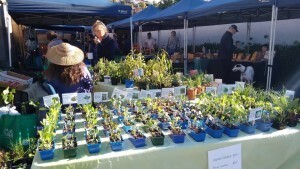 All Saints Market – South Hobart is spread out down the carpark on the city side of All Saints Church and continues past The Jesse Tree, All Saints Gift & Op Shop all the way through to the Quiet Gardens and behind the church into the Julie Hawker Centre at the back of the property. The Jesse Tree is also opened on every All Saints Market day and there is a range of products to browse through and buy including vintage clothing & homewares, collectables, books, handmade crafts & cards, plants and local produce as well as homemade goodies ranging from delicious home baked cakes, biscuits, jams and sweets, all sorts of crafts and do not forget to visit upstairs where you can rummage through the bric-a-brac. Don’t miss our pre-loved book store with around 3000 titles to choose from. The Jesse Tree is open between markets on Tuesdays, Wednesdays and Thursdays from 10.30am to 3.30pm and Saturdays from 9.30am to 1.30pm. Sit and enjoy a cuppa or a meal in our beautiful gardens. Be sure to scribble in the All Saints Market – South Hobart market days in your calendar!